To regulate their blood sugar levels, senior diabetics should know which foods they must avoid and which are permissible. While the dietary choices are many, some options include superfoods. On the other hand, some foods pose a greater risk. Broccoli, cauliflower, and kale are classified as healthy superfoods because they contain a chemical compound known as sulforaphane, which stimulates anti-inflammatory processes in the body that protect the cardiovascular system and regulate blood sugar levels. Sulforaphane also stimulates the body’s immune system to convert potentially harmful substances into less dangerous forms. In addition to eating nutritious foods, diabetic seniors can regulate their blood sugar levels by making healthy lifestyle choices. If your elderly loved one needs help maintaining healthy habits, consider hiring a professional elderly caregiver. Oakville families can rely on Home Care Assistance to provide dedicated and compassionate in-home caregivers who are trained in our holistic Balanced Care Method, which was designed to encourage seniors to exercise often, eat nutritious foods, maintain strong social ties, and focus on other lifestyle factors that promote longevity. Blueberries, blackberries, and strawberries contain insoluble and soluble fiber. Insoluble fiber eliminates fat from the body, and soluble fiber slows the digestive process, which deters hunger. Berries also harbor chemical compounds known as anthocyanins, which give these fruits their bright color. Anthocyanins also shrink fat cells and stimulate adiponectin release, which increases insulin sensitivity in cells and regulates blood sugar levels. As a rich source of magnesium, oatmeal stimulates the pancreas to release insulin while helping cells effectively use glucose. While some may prefer quick cooking oats, healthcare providers often recommend steel-cut oats, which are considered whole grains. In whole grain form, oats provide fiber, vitamins, and minerals along with antioxidants. In addition to being a rich source of protein, the omega-3 fatty acids in oily fish also reduce inflammation throughout the body. Almost all types of white flour products lack the bran found in whole wheat. The refining process makes the flour fluffy, light, and soft to give baked goods a more appealing texture. White flour causes blood glucose levels to spike without providing anything substantial in the way of nutrition. The loss of fiber also makes seniors feel hungry, which leads to unhealthy snacking. Baked goods contain high levels of fat, carbohydrates, sodium, and sugar, which raise blood sugar levels substantially. Chinese dishes are often high in fat, sodium, calories, and carbohydrates, all of which cause a dramatic rise in blood sugar levels. Sweet and sour dishes also contain large amounts of sugar, which is ill-advised for diabetics. 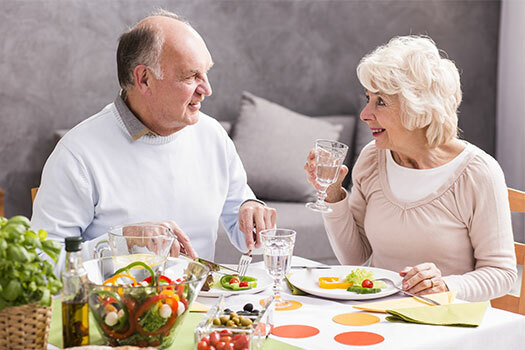 Seniors who need help switching over to healthy meals should consider professional in-home care. If your senior loved one needs help managing an illness or assistance with daily tasks, make sure you choose a top-rated elder care agency. Oakville Home Care Assistance is here to help your loved one live a happier and healthier life in the golden years. From the mentally stimulating activities in our Cognitive Therapeutics Method to our friendly Care Managers who are available to answer your questions 24 hours a day, we offer a wide array of high-quality at-home care services. Nuts are generally deemed a healthy snack. However, trail mix combines nuts with unhealthy substances such as dried fruit, honey, and chocolate. Dehydrated fruit contains concentrated amounts of sugar. Milk chocolate also contains large amounts of sugar along with fat. Although touted as being a healthy snack choice, energy bars are high in sugar and carbs. One bar often contains more than 400 calories and 60 grams of carbohydrates. Diabetics should read labels carefully to find snack options that offer a healthy balance of protein and carbohydrates while being low in fat. Older adults with diabetes may need help with an array of daily tasks. The services of home care Oakville, ON, seniors need can vary. Some need assistance a few hours a day, while others require more extensive around-the-clock assistance. At Home Care Assistance, we tailor our care plans based on each senior’s individual care needs, and the plans can be adjusted at any time. To design a high-quality in-home care plan for your aging loved one, call us at (905) 337-1200 today.